I love second courses that pair meat and vegetable in a single dish. Not only is the combination invariably delicious, but it saves the cook from making an extra dish. In this speciality from Puglia and Campania, lamb—the ne plus ultra of spring meats—is paired with peas—one of the classic spring vegetables. The lamb is browned then braised in a soffritto of onion sautéed in olive oil until almost tender, then peas are added to the braise until they, too, are tender. The result would be tasty on its own, but most recipes have you finish the dish cacio e uova style: eggs that have been beaten together with freshly grated Pecorino cheese are folded into the meat and peas until the heat of the pan sets the egg mixture, producing a creamy sauce. A substantial dish for sure, but one infused with lively flavors. In a braiser or sauté pan large enough to hold all the lamb, sauté the sliced onion in a olive oil over a gentle flame until tender and translucent. Raise the heat a bit and add the lamb pieces, turning them so they brown on all sides, taking care so the onion doesn’t burn. Season with salt and pepper as you go. Add a splash of white wine, give the pan a stir, and let the wine cook off. Add a ladleful of water, stir again, and cover tightly. Turn the heat way down, so that the lamb braises gently. Let it cook this way until the meat is perfectly tender, usually about 45 minutes. The liquid should have reduced considerably but not completely evaporated; check on the meat from time to time; add more water if needed to keep things moist. If using fresh peas: Shell the peas and add them about halfway through the braise, so they will be perfectly tender when the meat is. If using frozen peas: Add them when the meat is almost tender, along with another ladleful of water if needed, and let them braise with the meat for the last 5-10 minutes, until they, too, are tender and have lost a bit of their bright green color. To finish the dish, beat the eggs and grated cheese together (and if you like, a bit of minced parsley) in a bowl. Take the pan off the flame entirely, and pour over the egg and cheese mixture, and mix it well but gingerly with the lamb and peas, turning until the eggs have set enough to form a creamy sauce. Serve immediately. In Rome, where I lived during my years in Italy, most of the lamb you would find was extremely young. This kind of lamb, called abbacchio, is not more than four weeks old and weighs no more than 5 kilos. The whole animal would be cut up into parts that included both muscle and bone, a bit like a chicken. Perhaps this is why many Italian recipes will just call for “lamb” (agnello or abbacchio) without specifying the cut, with the notable exceptions of dishes like scottadito or costelette fritte, which are made specifically with rib chops from somewhat older animals. Here in the US, most lamb is quite a bit older, typically from 6-8 months and up to a year old. The average lamb sold here weighs over 100 lbs., so lamb is sold in discrete cuts, more like beef than chicken. In your typical supermarket, your choices will usually be the leg or various chops, from the rib, loin or shoulder. Occasionally, you will also find ground lamb and lamb “stew meat”. For this dish—and most braised lamb dishes—I like to use shoulder chops cut into pieces. Shoulder chops have a nice balance of meat, bone for sweetness and fat for juiciness, and they’re easy to find. Stew meat will also work. It usually has ample fat and sometimes, if you’re lucky, will have some bone in as well. If you’d like to make this dish ahead, prepare it without the final egg and cheese finish. When you’re ready to eat, reheat the dish and then give it its cacio e uova treatment right before serving. Lamb and Peas can also be served without the cacio e uova treatment at the end. It’s just as good that way, in my opinion. I’ve seen recipes calling for braising the lamb and peas in the oven, then pouring the cacio e uova mixture over the top without mixing, then letting the dish bake, uncovered, until the mixture has formed a light crust. Some recipes for Lamb and Peas add rosemary and/or garlic to the soffritto. Although rosemary is a classic seasoning for lamb, I actually don’t care for the idea in this dish. I think its strong flavor would clash with the delicacy of the peas and eggs—but who knows? I may be wrong. Try it and let us know how it goes. Jeanne Caròla Francesconi makes the dish with capretto (kid, or young goat) rather than lamb, sautés her soffritto in lard or butter rather than olive oil, uses Parmesan rather than Pecorino, and adds a squeeze of lemon juice to the finished dish right before serving. This last touch reminds me of a Roman lamb dish popular at Easter, agnello brodettato, lamb with egg and lemon sauce. The recipe also admits cubes of potatoes along with the peas. And you could also add wedges of artichokes to the dish, reminiscent of the classic side dish. In a braiser or sauté pan large enough to hold all the lamb, sauté the sliced onion in a olive oil over a gentle flame until tender and translucent. Raise the heat a bit and add the lamb pieces, turning them so they brown on all sides, taking care so the onion doesn't burn. Season with salt and pepper as you go. If using fresh peas: Shell the peas and add them about halfway through the braise, so they, too, will be perfectly tender when the meat is. I just finished making and eating this wonderful dish. OMG. I will make it again and again. So glad you like it, Nancy! Mark saw this post before I did and said, “We need to make this!” Of course, he is right. Thanks for the note on what cut of lamb will work best. I usually default to the very expensive boneless leg, so knowing about shoulder chops helps! Will report back! Please do, David! Hope you guys like it. Frank, after over a week in Campania, this particular recipe takes me back. It is authentic both seasonally and typical. Once again, a lovely post. Grazie per il commento, Vittorio! Ciao Frank, I hope you had a lovely Easter (I know it was delizioso!). I remember my dad making something like this and my mother-in-law (Calabrian)makes something similar. I love the idea of a dish for Easter that is no-fuss and rustic, but the cacio e uova at the end makes it even better! Beautiful recipe. The Gresio’s would approve (although they complained bitterly bout the lamb available in NYC -always calling it “mutton”). I also love combo dishes. And the eggs and cheese were a welcome surprise. Thanks, Claudia! I guess much of what we call lamb would indeed be considered mutton in the old country. Still we can make tasty dishes with it. Eggs and cheese at the end? Wow! I knew this dish didn’t look as “plain” as the main recipe. But I would never have guessed! Can’t wait to try this technique! Thanks, Mimi! Do let us know how you like it, if you do try it. Hey Frank…lamb and peas…yup it’s screams spring. But then the addition of the eggs…a never seen this before moment for me! Thanks for unearthing such an interesting idea! Worth a try, Phyllis! I like it both ways. I literally just marinated some lamb chops and came to check my mail and this is what I find! It’s too bad for me, I don’t like peas. I know, especially given the fact that I was born in Scotland, I don’t know what happened! I love simple recipes like this one, and I also love your commentary after each recipe. I always learn so much! Grazie, Frank! Interesting, Stefano! I imagine that the UK has excellent lamb even if it’s grown to be a bit older. True here in the US as well, although we’ve mostly lost the seasonality of the meat. I agree with you about frozen peas—over here, at least, fresh peas, when you can get them, tend to have already lost their sweetness, so I’ll take frozen any day. 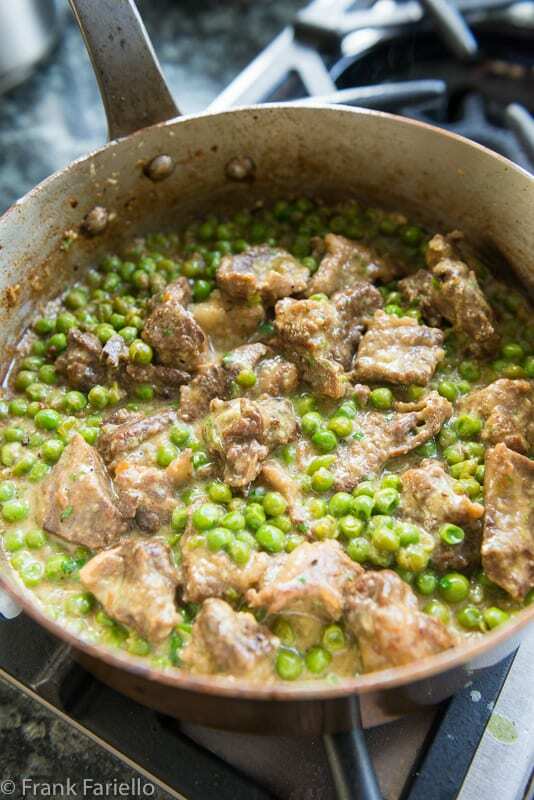 Looks delicious and it wouldn’t be spring without lamb and peas. Very interesting recipe — I’m unfamiliar with it but I’d love to try it. If my parents were still alive this is a dish I’d they would really enjoy. One thing I’ve found is finding meat with bones. It seems the trend for broth is having an affect on the meat cuts. Can’t wait to try your recipe. Buona giornata!! Couldn’t agree more, Marisa Franca—spring wouldn’t be spring without these ingredients. Grazie per il commento, cara!